For the second time in eight days, a prominent liberal has blamed the developing crisis in Egypt on global warming. We’re in the midst of a global food crisis — the second in three years. World food prices hit a record in January, driven by huge increases in the prices of wheat, corn, sugar and oils. These soaring prices have had only a modest effect on U.S. inflation, which is still low by historical standards, but they’re having a brutal impact on the world’s poor, who spend much if not most of their income on basic foodstuffs. Have food prices really soared? 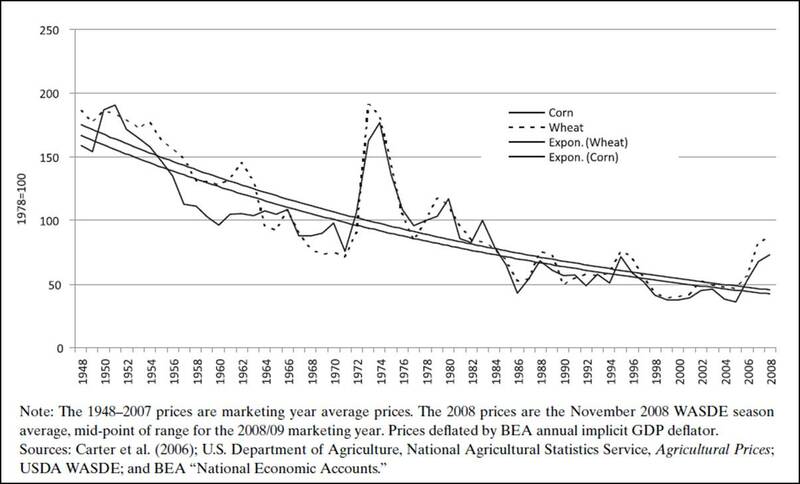 The figure at the top of this post is from a paper by Daniel Sumner, of the University of California-Davis (here in PDF), in which he seeks to place the 2006-2008 increase in grain prices into historical context. Current grain prices are at a similar level to the peak in 2007. Sumner's paper also has a figure going back to the mid-1800s. Good luck disentangling a long-term climate signal in the long-term data, which shows a significant decline in grain prices, much less attributing such a signal to a particular cause. Efforts to link short-term wiggles to the effects of greenhouse gas emissions go well beyond the canons of empirical science, to use a polite euphemism from The Climate Fix. As you can see, although grains prices have been spiking of late, adjusted for inflation, they are well below where they were in the '70s as well as several decades prior. As always, you can’t attribute any one weather event to greenhouse gases. But the pattern we’re seeing, with extreme highs and extreme weather in general becoming much more common, is just what you’d expect from climate change. Many press reports said that 2010 was a near-record breaking year despite the cooling influence of a La Nina later in the year. What was omitted however was mention of the fact that the reason why the year was marginally warmer than previous years was because of the warming El Nino. Contrary to press reports the evidence is that 2010 was a year no different from all of the years 2001-2009 with the exception of a moderate to strong El Nino that elevated temperatures in the Northern Hemisphere’s Spring, and a cooling La Nina later in the year. The standstill seen in global temperatures since 2001 continues. As such, contrary to what alarmists like Krugman claim, the world's temperatures haven't increased for twelve years. The only thing that has changed is their argument to tax carbon dioxide emissions. In the previous decade, it was that a supposedly warming planet was going to lead to a greater number of stronger hurricanes, melting glaciers and polar icecaps, and we'd all be swamped by rising seas. Such dire predictions have not come to fruition, and the public - aided by ClimateGate revelations of book-cooking by these alarmists - have grown increasingly skeptical of Nobel Laureate Al Gore's favorite money-making myth. With cap-and-trade legislation dying in the Senate last year, and little chance of it being revived in this new Congress, the climate fear-mongers are trying a new strategy to convince people that a less than one degree Celsius rise in global temperatures the past 160 years is causing food shortages that are going to lead to uprisings around the world threatening national security. The only conclusion is they will try anything however dishonest to get their wish of taxing carbon dioxide thereby controlling all aspects of commerce and human life while redistributing the wealth from the haves to the have-nots.